Green living • Other cities have seen reduction in emissions, better community health. 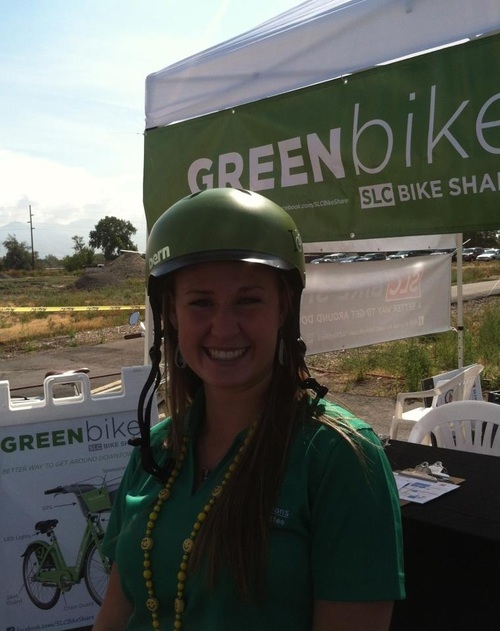 Courtesy | Ben Bolte L3 Communications Green Team Member Megan Welsh wearing an "I Bike SLC" Bern helmet. Courtesy Ben Bolte A View of Denver's B-Cycle program, a successful bike share initiative that Salt Lake City hopes to emulate. 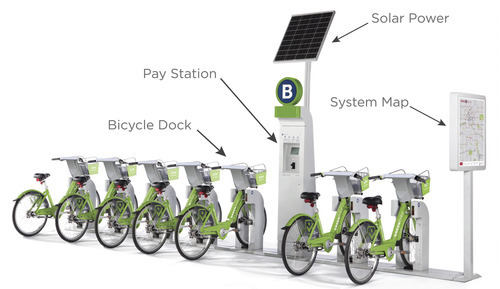 Courtesy Ben Bolte An artistic rendering of what the GREENbike solar-powered stations will look like around downtown Salt Lake City. Courtesy | Ben Bolte A view of the custom bike trailers that GREENbike will use to make sure stations don't end up with too many or too few bikes. With increased congestion, high gas prices and a fog of inversion settling deep in the valley, replacing a vehicle with a bike may feel like the responsible choice for any Salt Lake City resident. It&apos;s good in theory. But after a week of lugging around a heavy U-lock, fear of theft, dirty looks for taking up too much space on the TRAX train, and a flat tire or two, most commuters give up and consign their bikes to a dusty space in the garage. Ben Bolte, the Downtown Alliance Bike Share project manager, is looking to change that. 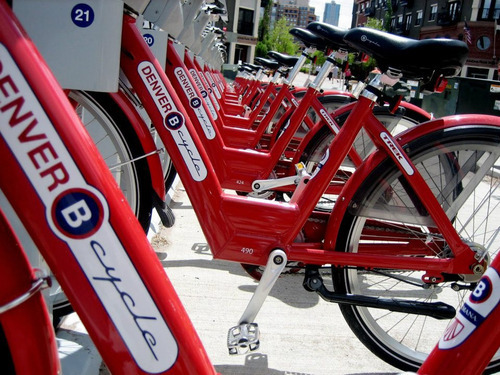 By April, Bolte, with the help of the Downtown Alliance and numerous sponsors, will launch the first bicycle-sharing program in Salt Lake City, GREENbike. The solar-powered, pay-as-you-ride stations have proven effective in other major cities, results that Bolte hopes Salt Lake City will duplicate. "Air quality is a big benefit," he said. "The bikes have GPS on them, so they&apos;ll literally track the amount of toxic pollutants and carbon dioxide that we&apos;re not releasing into the atmosphere. Along with that, there&apos;s also obvious health benefits and an enhancement to public transit." What started out as a European idea  shared resources and bikes strewn around the city  has grown up into a legitimate enterprise. The programs used in Denver, Minneapolis, Chicago and Washington, D.C., with high-tech checkouts and tracking capabilities, are the kind GREENbike will emulate. The success of the program has several other cities riding on the bandwagon. Miami launched DecoBike in 2011 with 1,000 bikes at 100 stations, while New York City&apos;s multimillion-dollar project with 10,000 bikes and 600 stations will launch this April. For Bolte, it made sense to start small, test the waters,and gain a following. GREENbike will launch in April with 10 stations and more than 100 bikes. With increased funding and word of mouth in an active community, he hopes to expand the project across the valley. Greg Reid, community relations director at SelectHealth, is hoping for rapid expansion as well. Already a major sponsor of the Downtown Farmers Market, SelectHealth was quickly on board as the primary sponsor. Like the Farmers Market, GREENbike fit in perfectly with the company&apos;s goal of improving health throughout the community. "It&apos;s our hope that this program does well," Reid said. "We&apos;d like to see this extend out to Murray and the University of Utah. We want to be hands-on and very supportive and watch it go and grow." GREENbike will start at $5 per day, with the opportunity to purchase a yearly membership for $75. Those who work for Salt Lake City and employees of sponsoring companies also may qualify for a discount. In 2012, Utah was ranked 13th on the League of American Bicyclists&apos; listing of bicycle friendly states, up from 31st in 2011. 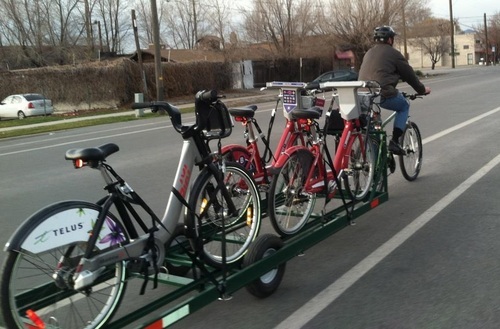 In Colorado, 43 percent of Denver B-Cycle users said they replaced car trips with bike rides. The average American household spends $8,758 per year on car payments and operating costs, more than it spends on food.